This family-friendly event features midway rides for all ages, from kiddie rides to thrill rides, carnival games and favorite fair food! Experience the sights and sounds of moving, breathing, walking Dinosaurs! Interact with 50 Giant Dinosaurs, get up close and see the voracious Velociraptors, the massive ferocious Tyrannosaurus Rex, and the soaring Pterodactyl! Jurassic Adventure will stimulate your childs imagination as Dinosaurs come to life right in front of their inquisitive eyes. For the second time, the Family of the Fallen is proud to host the Police and Civilian Krewe (P.A.C.K.) Challenge. Created for motorcycle enthusiasts, the challenge invites law enforcement officers and civilian riders to train and compete on the same courses. Not only will riders be able to take their training to the next level, they will see how they measure up against some of the best riders in the area. Join us May 4th and 5th at The Shoppes at Bel Air! 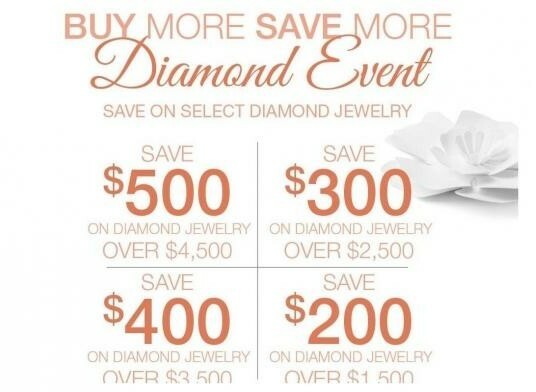 Save on select diamond jewelry for a limited time!